Antidote Magazine is a trusted authority and a nationally established city guide. Antidote’s mission is to guide you through your own back yard to see what your local community really has to offer. To introduce you to Ottawa’s innovators in the disciplines of cuisine and mixology, Antidote Presents invites you to the Supper Club. The debut edition of the Supper Club for the fall season will be held at Murray Street on September 1st, 2015, from 8pm to 1am. The Antidote Supper Club is a small group of local and semi-local experts, artists, and oenophiles unified by one philosophy: that the antidote, the remedy, is diversity. Ottawa’s culinary scene has been rapidly evolving, and with so many new concepts around the city it is a wonder how we are able to cook and fend for ourselves. With so many choices, how is one to know what’s next or what’s best? 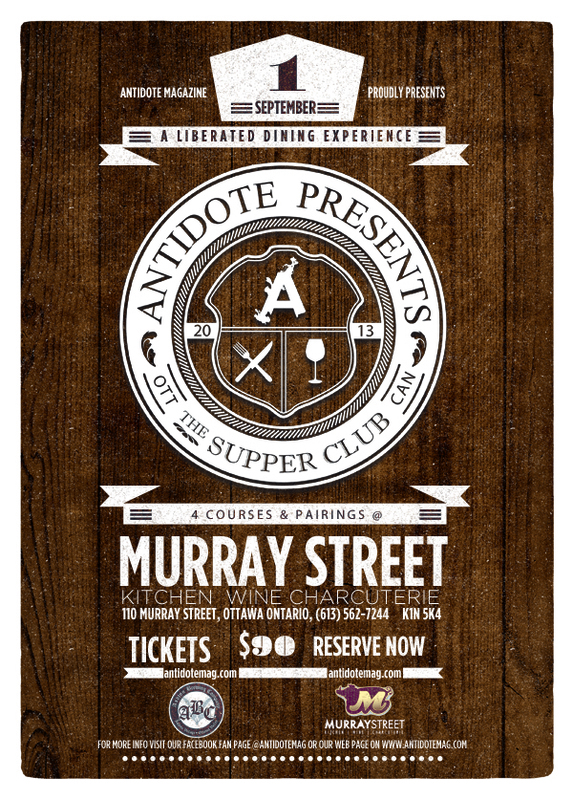 On September 1st, the first Supper Club event of the year will be held at Murray Street Restaurant in the Market at 110 Murray St. Your meal will be meticulously prepared by renowned local Chef Steve Mitton. The Ashton Brewery has also signed on for the event, and will be working closely with Murray Street to provide our guests with pairings that will arouse the senses and tantalize the palette. Tickets can be purchased through Antidote’s Pay Pal account, or at Murray Street itself. We value face to face relations and human connections. This means tickets can ONLY be purchased online or at our host venue’s. The Antidote Supper Club is a nomadic dining experience that will be hosted from venue to venue highlighting the city’s most incredible chefs, sommeliers and creative culinary concepts. With every event with Antidote, you will undoubtedly develop a deeper appreciation for food, wine and beer, make long-standing connections, learn of the contours of your local community- finding hidden gems that you didn’t even know you had. All the while, you will be having an exceptional time.